Although Netwrix products are easy to install, configure and use, we realize you might need help at times. 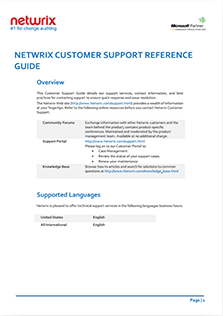 To ensure your success with Netwrix, we offer a variety of support options, all delivered by first-class, U.S.-based customer support with a solid 97% satisfaction rate. Receive Basic Support services free of charge while you evaluate the trial version of Netwrix Auditor. Get free product upgrades and updates along with technical support via email, phone or web during business hours. In addition to Basic Support features, get 24/5 software support services with faster response times. Entrust Netwrix Auditor deployment to our Professional Services team and get maximum from your investment. Engage with other Netwrix freeware customers and the product management team in the Netwrix Community Forum. in our Support Reference Guide. and knowledgeable, and they have excellent communication skills."